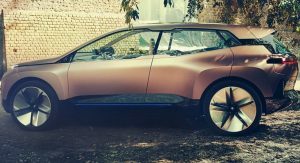 The first official images of BMW’s conceptual electric crossover, the iNEXT, have surfaced online. 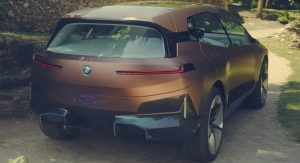 Set to preview the 2021 production model, the iNEXT is a futuristic crossover that is infused with BMW i DNA. 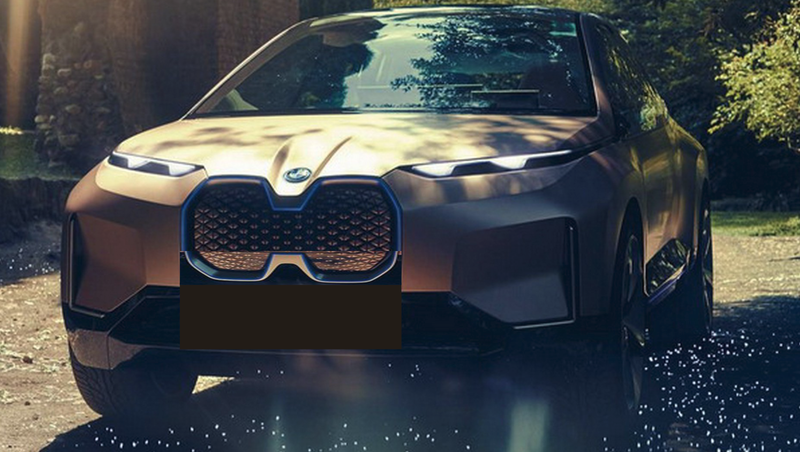 Originally spotted on Bimmerpost, the pictures show the concept has a massive twin kidney grille with a fake mesh insert. The grille also features a blue chrome surround which hints at the model’s eco-friendly powertrain. The grille sits in between slender headlights and recessed sections of the front fascia which channel air into slender intakes. Further below, we can see gloss black accents which mimic plastic body cladding. Moving further back, we can see BMW has embraced the side camera mirror trend that is being pioneered by Audi and Lexus. Elsewhere, there are massive wheels and a distinctive greenhouse with ‘pinched’ accents on the B-pillar (or where it would traditionally be). The concept also features pronounced rear wheel arches and a relatively flat roof which meets a tailgate-mounted spoiler. While the rest of the crossover has a bold design, the rear end is slightly generic. However, the model has a rounded tailgate with slender brakes lights. Further below, we can see a heavily stylized bumper with blue accents. The cabin takes a different approach as it features a minimalist design which is largely devoid of controls and trim. Instead, drivers sit behind a rectangular-shaped steering wheel and find themselves looking at a ‘floating’ digital instrument cluster. A widescreen infotainment system is located nearby and it appears to have a metallic frame. 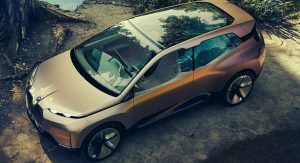 Additional details are hard to make out, but the iNEXT has a panoramic glass roof and a unique center console that looks like it has a wood and marble top. The dashboard also appears to be covered in wood while there are metallic accents on the door pulls. 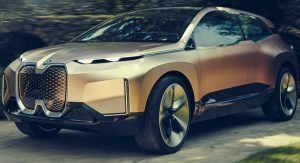 BMW has been tight-lipped about specifications, but the company’s e-mobility roadmap confirmed the production iNEXT will be a “Gen 5” electric vehicle. 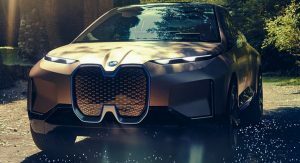 The automaker has already confirmed these modes will have a modular battery pack with a capacity ranging from 60 kWh to 120 kWh. This will enable future electric vehicles to have a range of up to 435 miles (700 km) on a single charge. 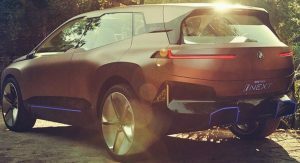 Besides the high-tech powertrain, the iNEXT is slated to have an advanced semi-autonomous driving system. 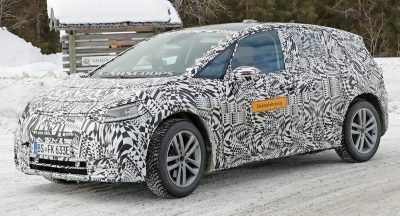 The model is expected to have Level 4 system which could enable the vehicle to drive itself in a number of different situations. just no, wth are they smoking at bmw? 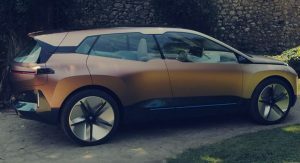 Remember when the BMW “I” brand and concepts used to be (actually) futuristic, (actually) beautiful, and (actually) cool. (Not just the “I” brand concepts, but also their concept vehicles and their vehicle plans and ideas in general… (i.e. 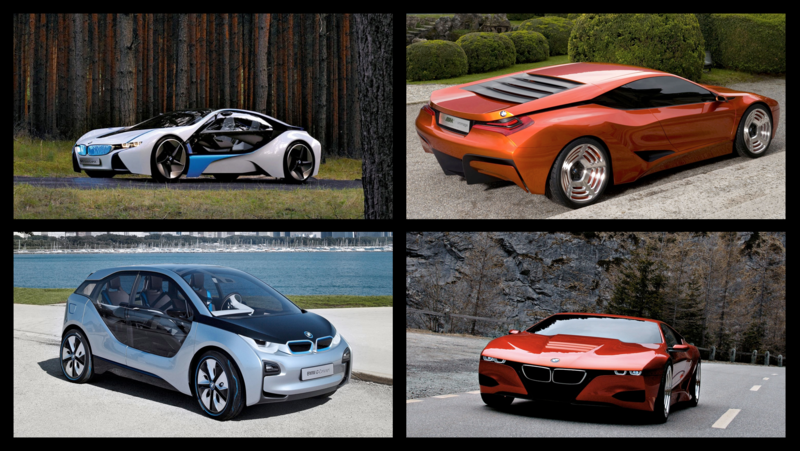 the; BMW M1 Concept, BMW Efficient Dynamics Concept, BMW i3 & i8 Concepts).). I remember the direction BMW had back in 2008 and prior – 2013, and to be quite honest it seems as though they’ve (not only become un inspired) but have lost their way. 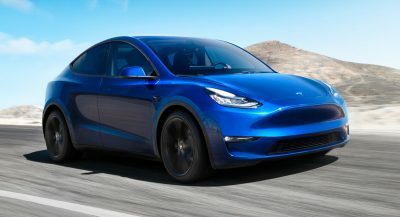 Every since their lead designer for the iBrand vehicle left, we’ve gotten concepts and uninspired vehicles that look similar to the concept vehicles shown above. I personally look forward to a day when BMW can find their way again (at least when it comes to design). OMG that is one of the ugliest front designs I have ever seen. Just put in normal sized Kidney grille like current cars, no need for this ridiculous hole at the front, like What in the world!!! Have you seen the X7? They are going all in with that hideous grill. And you even saw it spelled correctly and still didn’t get it right. This is an international comment section where each try their best at communicating in their first or second language, or even the third. Spelling bees may happily engage themselves on others forums instead if the written globalistic english language here gives no meaning to them. WTF? 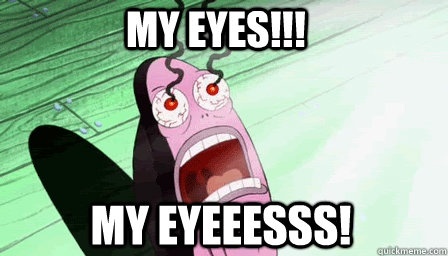 MOST FUCKED UP THING EVERRRR! 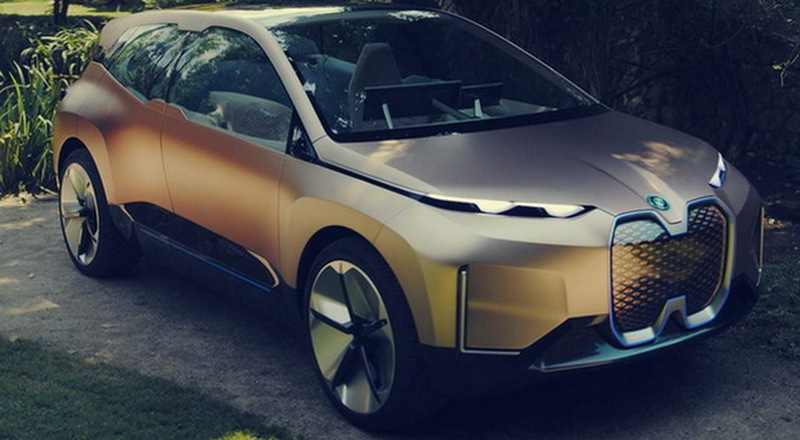 That is a really cool and nice looking car, clearly in family with the i3. Sadly only a concept though. 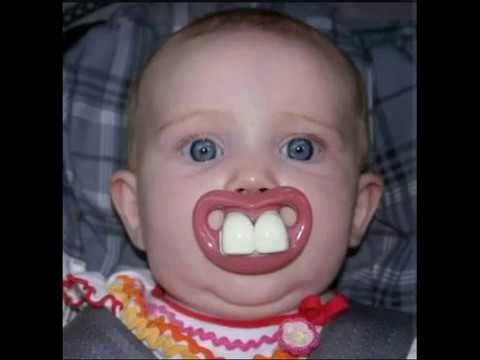 Talk about a face only a mother could love! A Predator mother! I did however laugh out loud when i saw the pedals, positive for accelerator and negative for brakes. Overall, this thing however is a mess. It’s a pig. And not those small cute ones at all. Where’s my barf bag? 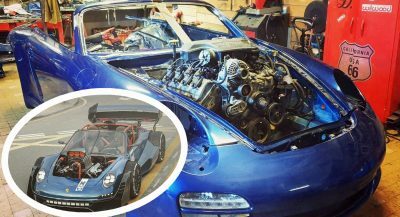 This insanity (not just with BMW) has got to stop. Before long, we’ll have our choice of 10,000 models to choose from. It comes with four passenger barf bags, but they’re part of the Advanced Safety Package. Ladies and gentlemen, the nearsighted beaver. You have summed up every carmarkers conundrum for the history of life. I agree completely. When people ask for a new design they usually want a good looking car. 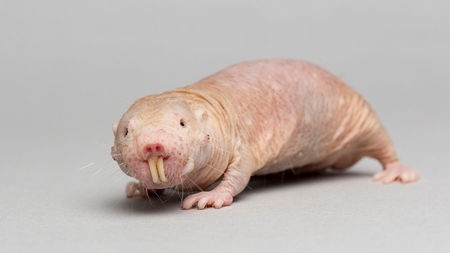 Not something that is hideous. Bmw is just bad at designing SUVs. I hate when people say this. Design is subjective. No one party is can determine good vs bad design. I am pretty sure some cars that have been prouduced were risks that paid off. Why do you think car companies hire a large team of designers? Their job is literally to make tonnes of new designs and argue daily about what is good looking vs what is not. Hyundai without a corporate grille can make their Tucson look better than the X1. You want bold designs? Look at the NX200t. Park an X5 next to a Velar or even an Evoque and its pretty blindingly obvious which company spent more time designing their cars. As a designer myself i agree that design is subjective. But you must always know what works and what doesn’t, if you dont like your own design, almost nobody else will. With sufficient people, time and effort put into it, it’s not impossible to make a good design. And all of you though the Juke and Aztec were ugly? Again I really don’t know what’s wrong with the Germans these days. First they destroyed their country in 2015 with Merkel now they’re destroying their auto industry with this VULGAR design! This a joke? A horrible, horrible joke? Damn. And I thought Lexus was bad…..
Its not 1998 guys, WTH is that…. well, it was fun while it lasted guys. So long BMW. Now that is one ugly face… Absolutely horrendous! Bush league design. I don’t understand this grille. It’s like a nightmare. How do you say “Edsel” in Bavarian? Rear end and side profile get a solid score. Floating roof/rear pillar has been done nicely, the rear looks stunning from all angles. I like the side window aperture shape and the big boxy wheel arches on the round body side. Wheels are a good choice. The front needs refining, but give it the same elegance as the rear, keeping the aggression, and it’ll be a winner. Also really liking the direction of the interior. I hope it looks exactly like that in production form. No changes, especially to the grille please. That will give us countless years of good humorous material to write about on all these blogs. Thank you BMW! The Twin-Edsel grill. Very unique. Not much of a looker. The Bugs Bunny teeth are a rival for Lexus’ spindle. Who the hell approved the oversized kidney grille…. 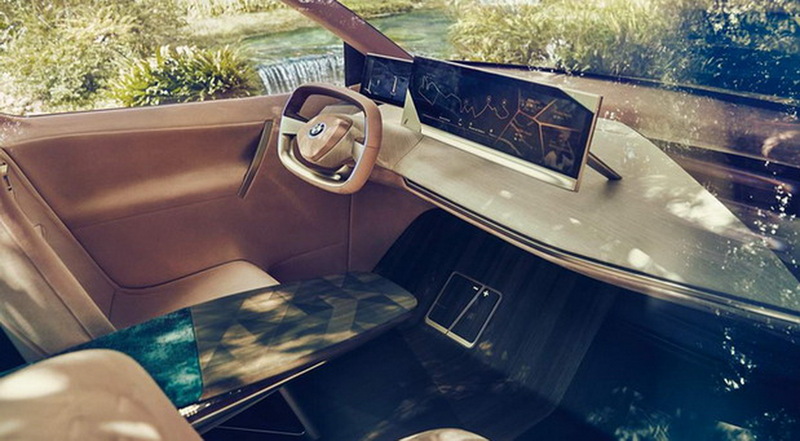 This is a concept for 2021, the Tesla Model 3 today its interior already looks as clean and advanced as this.